> I am mucho excited about my most recent little purchase. I was wandering through Zellers, looking for cheap white 100% cotton sheets to wrap my oh-so-sensitive wedding dress in and I got lost in the small appliances section. I think it was fate. 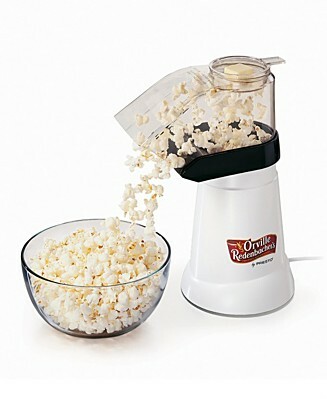 I was grumbling to myself about the casino-like nature of department stores when I saw it: an air pop popcorn maker. The last one in stock. Now, I’ve been wanting one of these forever but have been reluctant to spend too much money on one. And technically I probably should have waited until I found one with glass rather than plastic parts. But I was too happy about the price to care. Tonight’s West Wing snack: popcorn!! Note: I found the sheets in the end (yaya!) but now that the dress is all wrapped up, I have nowhere to put it (boo). I wish we had an under-the-bed space. Huh…excuse to convince A. that we simply must buy a bed frame? I think so.